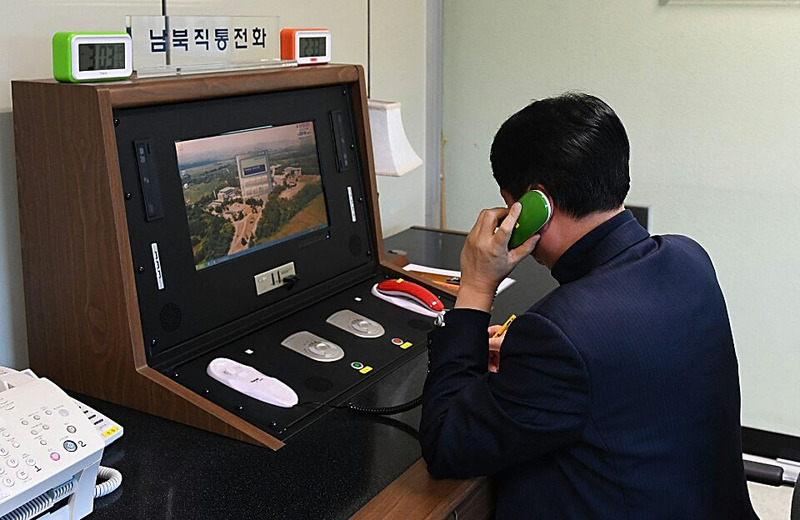 A direct line of communication between North Korean Leader Kim Jong-un and South Korean President Moon Jae-in will open today. A direct line of communication between North Korean Leader Kim Jong-un and South Korean President Moon Jae-in will open today with the connecting of a hotline between the two leaders. Negotiations over Pyongyang’s nuclear program have progressed recently, with Kim and Moon scheduled to meet next week. Moon recently claimed that the North is seeking “complete denuclearisation”, as Seoul and the US want. North Korea’s Communist Party will hold a plenary session today; any shifts towards denuclearisation could be revealed there. On the American front, it was revealed that Secretary of State nominee Mike Pompeo met secretly with Kim over Easter weekend in preparation for the upcoming summit between the North Korean leader and President Donald Trump. Trump tweeted that the meeting went “very smoothly” and said he will likely meet Kim in early June. All these developments point to talks continuing apace, perhaps even with the potential for a breakthrough. Look to Pyongyang to see if Kim mirrors Moon’s claims about denuclearisation. Even if the North talks up the possibility, it is likely too wedded to its deterrent to give it up without significant concessions.